It's safe to say it: South Park is on a roll this season. 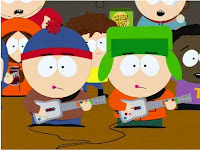 Following up the phenomenal "Imagination Land" trilogy, the South Park gang set its sights on the Guitar Hero series in tonight's episode. While one can argue that South Park is leaning a little heavy on commercials that advertise/satirize video games (the Emmy Award-winning "Make Love, Not Warcraft," for example), it's hard to argue with them when they nail their subjects so skillfully. Tonight's episode saw Stan and Kyle attract the attention of a record producer due to their high score playing "Carry on Wayward Son" by Kansas. But their journey soon leads to hardships, as success strains their friendship and Stan throws his career away when he becomes addicted to Heroin Hero. Kudos to Trey Parker and co. for several great moments. Randy's introduction to the game and his inability to understand why the kids don't just play real guitar, the kid so good at Guitar Hero he could play acoustic (tap tap tap tap tap), Stan and Kyle's reward for scoring 1,000,000 points. All classic send-ups of a game that has fast become a console sensation. Catch the encore tomorrow, November 8th, at 10 p.m on Comedy Central.